Therapy for Pain relief and More! Did you ever think how great it would be if we could plug our weary bodies into a battery and get recharged. That technology is now here and it is called PEMF which stands for Pulsed Electro Magnetic Field therapy also known as Pulsed electro magnetic cellular exercise. Dr. Oz has called it the Medical Miracle of the 21St Century. 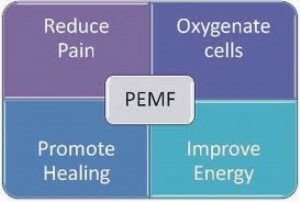 What does a PEMF device do? The PEMF has been engineered to produce extremely brief, but repetitive pulses of magnetic field energy in nanoseconds (that’s a billionth of a second). This pulsed magnetic field is supportive energy that can be used to restore damaged cellular structures, pump out toxins, and optimize cell performance without generating heat, ionizing radiation, or tissue damage. In essence, all cells exposed to a pulsed magnetic field are being exercised: expanded during peak exposure to the magnetic field and relaxed on the off phase.